Look up? How about look down, where you’ll see a growing number of SIGNARAMA floor graphics being used by businesses in the know. This surge in popularity can be attributed in part to the new range of specially formulated materials SIGNARAMA uses in creating floor graphics to get the message across while maintaining top durability in high traffic area. Floor decals are removable and easy to care for. We can cleverly incorporate the currently unused floor space of your business to sell and promote featured products. Floor decals are becoming very popular at SIGNARAMA stores all over the world. The obvious choices for floor graphics are supermarket and food related businesses, where customers can be introduced or reminded of popular brand names and products. Fancy designs and bright colors catch the eye and project an idea or solution in an unlikely place. SIGNARAMA floorgraphics have also been popular among big box retailers and “do it yourself” hardware and repair centers. Often the cost of floor decals can be offset through the manufacturer of a particular product. Our stores have created floor graphics for marine retailers, automotive retailers, clothing stores and financial institutions. SIGNARAMA has the experience and creativity to put your message near many potential clients and customers! 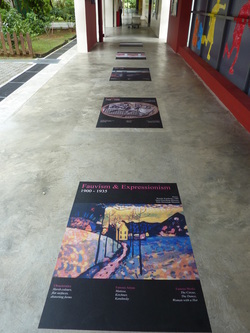 Floor graphics are high in durability and can even be used outdoors on surfaces traditionally not seen as signage. Our floor signs resist tearing, scuffing and many abrasive forces. Our stores have created temporary event floor graphics, directional floor graphics, safety floor decals, parking floor decals and special advertising campaigns. Some of the most memorable floor graphics entice the reader to “follow the clues” on a self guided trail… imagine the possibilities with SIGNARAMA! If you need floor graphics in any size, color or shape, come to SIGNARAMA to stay a step ahead of the rest.